President Donald Trump has changed his opinion of a judge he once criticized as impartial because of the jurist's Mexican heritage. At a court hearing Wednesday, a lawyer for Donald Trump praised Judge Gonzalo Curiel's handling of a settlement stemming from class-action lawsuits against the now-defunct Trump University. Attorney David Kirman called it a "textbook example of a district court properly administering a settlement." Federal judge Andrew Hurwitz interrupted, asking, "So your client's view of Judge Curiel has changed?" Kirman responded, "Your honor, yes. It's our position that Judge Curiel administered this settlement in a textbook fashion." In June 2016, with lawsuits still pending against Trump University, then-candidate Trump told CNN's Jake Tapper that Curiel couldn't be impartial because he is "Mexican" and added that Curiel made "bad rulings" and that Trump had "been treated very unfairly." Curiel, who is of Mexican heritage, was born in Indiana. The exchange Wednesday occurred during a hearing before a three-judge panel at the Ninth Circuit Court of Appeals where attorneys argued whether one former Trump University student could opt-out of the settlement in order to personally sue President Trump. Trump's legal team is seeking to preserve the terms of the settlement. Trump agreed last November, just days after the president election, to settle three lawsuits filed against his now-defunct real estate school for $25 million. Curiel approved the terms in March and called it "extraordinary" since it would award class-members most of their money back. But former student Sherri Simpson stalled the payout of that money with an appeal filed in May. A lawyer for Simpson, Deepak Gupta, told judges they should reverse approval of the settlement because it did not give Simpson sufficient opportunity to opt-out of the settlement and pursue a lawsuit on her own. Judge Hurwitz responded saying, "What you're asking us to do is to unravel a settlement that's fair for thousands of people because your client thinks she could have opted out of it again... When I think about this case in real world terms, that's what troubles me." An attorney representing the class of former students, Steven Hubachek, described Simpson's position as unreasonable and said her ambitions to sue the president have "a political aspect." Trump's attorney, Kirman, said that allowing one student to opt-out and file a separate suit would nullify the terms of the settlement, which resolved all disputes involving Trump University. Weeks or months could pass before the judges issue a formal ruling on the appeal. 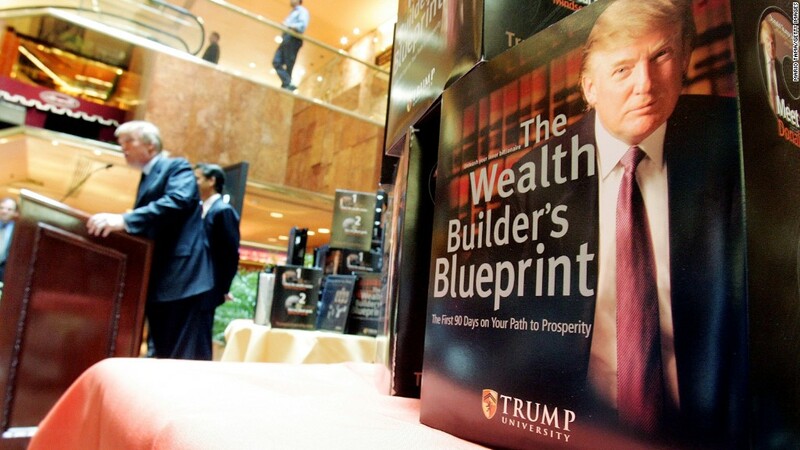 Two class-action lawsuits and another suit filed by New York's attorney general accused Trump University, which effectively closed in 2010, of defrauding students with false advertisements and unfulfilled promises made about its offerings. Despite its name, the program was not a licensed university. And although Trump said in ads that he personally chose instructors for the courses, he did not remember any of those "hand-picked" instructors when read a list of their names during a deposition. By settling the case, Trump avoided the possibility of testifying at a trial. Trump has denied the fraud claims and previously tweeted that he could have won at trial but did not have time because he wanted to focus on the county. Simpson, a registered Democrat who was featured in an anti-Trump commercial during the 2016 campaign, previously told CNN she wants to personally take Trump to court to recoup the roughly $19,000 she spent on Trump University courses plus triple that amount in damages. "The mere fact that he is now our president shouldn't stop me or anybody else from continuing a lawsuit... that was started on the basis of a fraud that was committed against us," Simpson previously told CNN. "I feel he got away with it."